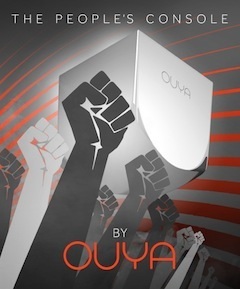 If a console is judged by its game, then we shouldn’t say much about Ouya, just yet. Many of the developers are actually waiting until closer to the official launch, coming some time in June. It has been pushed back to address larger than expected pre-orders, some minor production delays, etc… but all in all, the Ouya console hasn’t had a lot of problems getting out to their Kickstarter supporters! Upon opening the box for the first time, I was greeted with a giant red Thanks for Believing banner inside the box – a great gesture! Then I examined the console (with the names of the top level contributors etched in to it) and the controller. HDMI cable and power cable reside underneath the plastic inlay in the box. As well as a manual, which I have yet to crack open (although, admittedly, there may be an RTFM moment later in this post). First, let’s talk about the build quality. I haven’t had this thing on for more than two solid hours at any given time so far, but thus far it seems to do a good job of cooling itself. There is a fan tucked in that tiny little case, which is amazing in itself. It has frozen up on me one time, but it hadn’t been online for very long, I believe there was just something strange happening when I tried to download a game and my WiFi wasn’t reliable – it would be nice if there was an ability to submit system logs or crash reports to the Ouya manufacturers. The console’s build quality is superb. Surprisingly, the controller itself feels a little cheaper in the hand – a bit disappointing since you’ll be holding this and this is how most people will “experience” the Ouya. Apart from admiring it from afar, most people will never pick up and feel the weight and solid build of the Ouya console. The controller’s brushed-metal looking face plates pop off to reveal battery compartments in the left and right grips. The battery goes on top of the small “strap” which will allow for easy removal of the battery in the future (I can already hear people asking what the little straps in the battery compartments are for). When you turn on the console, you first Sync your new controller, then you connect to a WiFi network. This was my first moment of frustration with Ouya. Every time I would press the D-Pad or the analog stick to begin typing my WiFi password, the on screen keyboard would close itself. After pressing every button on the controller at least once, I heard a ‘popping sound’ which seemed to come from the right trigger, then I felt the right faceplate shift into place. Some button was sticking and causing my problem. Once everything ‘snapped in to place’ (literally), then I could enter my WiFi password and continue to download an update (which, surprisingly, has a few one-liners to help you pass the time). Once the system update is applied, you login with your Ouya account. I started to get excited, because I’ve talked with a few other Ouya owners and we expected to add each other to our friends lists… no such luck. Your account simply keeps track of your downloads, and allows you to keep your credit card information on file. That’s it. No friends lists. No messaging. No profiles. No pictures. Nothing to customize, nobody to talk to. It’s just you and your games. Once I got over that, I used the game’s simple interface to look for games. Your only options at the main menu are PLAY, DISCOVER, MAKE, and MANAGE. Play is empty – the console ships with no games. Discover is where you go to find the games to download. Make allows you to access the built in web-browser and is where you can sideload your own android APK’s via a USB stick or download from the internet, as well as download the SDK for Ouya to start making your own games (also called the ODK Manage allows you to customize many of the Android Specific settings, switch wireless network, sync more controllers, etc… there is an area for your account, but you can only sign in and out of other Ouya accounts; again, there are no profiles to complete or friends lists to add your pals. So then I checked out the games. Right now, all you need to know as that there is a game coming called Fist of Awesome and you’ll want to buy it. I played it, my 62 year old father watched me play it, and even he was cracking up while I was going through the demo (A Bit of Fist of Awesome). It was an extremely fun beat’em up (think: Final Fight), with throw back pixel graphics and tons of comedy. King of the Hill is a fun “Trials” like game where you try to get a top-heavy motorcyclist up a mountain. In addition to those titles, you can also check out Vector, which is like Canabalt (also available), but with better animation (and a little more predictability in the levels, for people quickly frustrated by Canabalt). Next: Flashout 3D. This was the first game I downloaded. Very simply, it’s similar to Wipeout, F-Zero, or Fatal Inertia. This was the first game I played on the Ouya and gave me my first big moment of disappointment in the “open-ness” of OUYA. Let me explain. The biggest negative about Ouya is that the manufacturer just wants to be a piece of hardware. But without some design standards, the experience is going to get very messy. In the case of Flashout 3D, pressing the “OU” button in the center of the controller opens a menu on the screen. This is an in game menu for adjusting volume, etc… after several confusing minutes, I realized that in order to exit games in the Ouya, you had to DOUBLE TAP the “OU” button in the center of the controller. I started to think that this may have been explained in the manual, had I chosen to read it, but it seems that not every game is like this. With some games it’s a single tap. Others, yet, have an option on the main screen to exit the game back to the console’s main menu. This leads to my next complaint, which I hinted at above. The Ouya network doesn’t exist. Right now it’s a store. Every game has its own leaderboards, where you enter your name individually and rely on their servers. I had hoped to have my universal sign in used by every game, but that’s not the case. It doesn’t serve as a “back-end” for the games themselves the way PlayStation Network or Xbox Live does – at least not yet. But it’s going to be even harder to implement that later. The worst are the games that clearly had no intention of developing for Ouya, they just ported their game over. Maybe they will be updated as time goes on, but right now games like Critical Missions: Swat has some of the best graphics to be seen on the console so far. But the controller lag is in the measure of full seconds, making the game impossible to play, and the onscreen controls for touch screen Android devices are still showing. If developers are putting out games on to the Ouya “Discover” store before they’re ready for prime time, it’s going to give Ouya a bad name. The console, as a theory, was great. Open to anyone and everyone. But, even before launch, we can already see how it might lead to some negative experiences for users who aren’t quite as understanding as their Kickstarter backers. It’s going to be an interesting few months as the content increases, and hopefully it’s more positive than negative. Only time will tell, but I do believe in what it has to offer and I’ll be along for the ride now that I’m here!